In the last post, we discussed how God mutually shared power with the man and woman by giving them mutual blessings and responsibilities. In this post, we will discover what happened to power and “power distance” due to the Fall. The perversion of power that began at the Fall effects leadership still today. As we continue to practice exegesis, we must realize that the serpent did not call into question “gender roles and authority,” but he did question God’s authority. “Did God really say?” The serpent strikes at the foundation – God’s authority on the couple. The overall Genesis narrative sets up the larger story regarding the battle between God’s kingdom and Satan’s kingdom. The first man and woman failed the test. They questioned God’s perfect goodness. Though made in God’s image, they fell to Satan’s words that they would be “like God.” Satan enticed them to seek to determine their own moral authority – not abide by God’s authority. I have realized that every time I choose to sin either by commission or omission, I do the same thing. I place my own moral authority over God’s. Ouch. Do you notice how our culture does this at an alarming rate, and Christians are very easily influenced by their reasoning rather than God’s standards? The author of Genesis 3 wants us to recognize the devastating loss of loving harmony between the man, the woman and God. In Genesis 1-2, the man and woman existed in sinless perfection, together stewarding the earth. But in Genesis 3, we find the origins of today’s fallen tendencies. The woman typically tends to give her power away in order to secure a relationship. The man tends to take power and dominate. 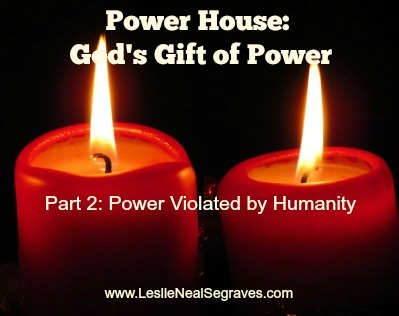 Unequal distribution of power…how do we accept it? How do we expect it? How do we try to alleviate it, or not? How much do we accept that cultural norms are God’s standards? How often do cultural norms play out, not only in the world, but in the church? A woman in her 30’s once told me, “I always knew I was smart, talented, and gifted. But I just figured that God didn’t really need me [in the church] because I was a woman.” This, my friends, is also the result of power distance. Satan desires to limit the powerful influence women can have in the church and world. When God assessed the pre-Fall Garden situation in Genesis 2 he said it was “very good” because he saw both male and female sharing blessings and responsibilities. Though the tendencies of the Fall call out to each of us, thankfully, Jesus does not leave us without hope and without power. In fact, in Acts 1:8 Jesus promises that the Holy Spirit will “empower” believers to do God’s work in the world! One of my dear friends in East Asia served for 9 years in prison for her faith. She currently leads a network of millions – both male and female. My first meeting with her took place in a dark, quiet room where she and I spoke quietly of her dreams and God’s vision for the movement she leads to spread God’s Name through the toughest regions of the world. She continues to live out the power of the Holy Spirit, rather than hiding behind power distance and accepting the limitations imposed by culture and by the Fall. With whispers, I shared how in many U.S. churches women are not even allowed to take up the offering. Together, we prayed her movement would impact not only the most difficult regions of the world, but also the church of the U.S. If Jesus were to walk into your church on a Sunday morning, would He watch the worship unfold and say, “Oh it’s very good!” or would he notice the one-sided leadership based on external features? God provides a better way through His crucifixion and resurrection! Join the conversation – Are you living under the dark cloud of Genesis 3, or are you allowing Jesus’ crucifixion and resurrection to release His power through you?